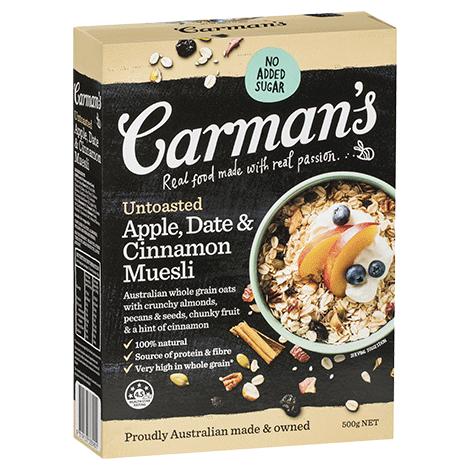 Welcome your morning with a bowl of untoasted Australian whole grain oats, chunky dates, apples, vine fruits and a blend of crunchy gourmet nuts and seeds. Whole Grain Oats 66%, Fruit 20% (Dates 6% [Dates, Rice Flour], Raisins [Raisins, Sunflower Oil], Currants [Currants, Sunflower Oil], Apple 3%), Nuts (Almonds 8%, Pecans 0.6%), Seeds 5% (Sunflower Seeds, Sesame Seeds, Pepitas), Cinnamon 0.4%, Natural Flavour. To prove you’re not a robot, can you tell us what’s 1 + 4 ?